Indian Express explains a significant reform — given the bad-loan crisis in banking, and cases of default such as Mallya’s. 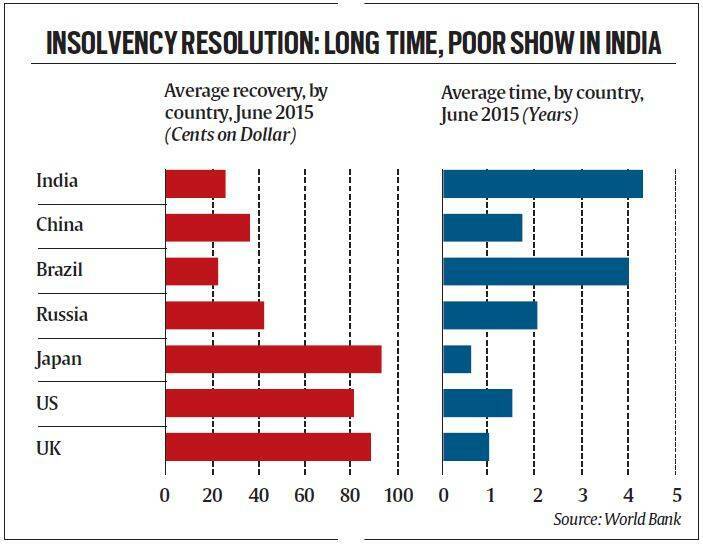 Lok Sabha last week passed The Insolvency and Bankruptcy Code, 2015, a law aimed at speedy winding up of insolvent companies, lowering NPAs, and redeploying capital productively. KHUSHBOO NARAYAN explains a significant reform — given the bad-loan crisis in banking, and cases of default such as Mallya’s. Technically, what exactly does bankruptcy amount to India? Being bankrupt is a state of inability to repay debts to creditors. Under the proposed law, a bankrupt entity is a debtor who has been adjudged as bankrupt by an adjudicating authority that has passed a bankruptcy order. The adjudicating authority would be the National Company Law Tribunal (NCLT) for companies and limited liability partnerships, and the Debt Recovery Tribunal (DRT) for individuals and partnership firms. Why is a bankruptcy law such a big deal? India’s banking industry is in the throes of a crisis. Bad debts are piling up at banks. According to central bank data, stressed assets (which include gross bad loans, advances whose terms have been restructured and written-off accounts) rose to 14.5% of banking sector loans at the end of December 2015. That’s almost Rs 10 trillion of loans that are stuck. Freeing up this money is crucial for the banking sector to go about its business. So, there weren’t any laws dealing with this problem until now? There are, in fact, several laws that deal with insolvency for companies, such as the Sick Industrial Companies Act, the Recovery of Debt Due to Banks and Financial Institutions Act, and Securitisation and Reconstruction of Financial Assets and Enforcement of Security Interest Act, 2002 (SARFAESI). Then there are a couple of laws dating from the time of the British Raj for dealing with individual debtors. However, this multiplicity of laws has been a problem in the way of banks failing to recover their loans. For example, DRTs are dealing with a backlog of Rs 4 trillion worth of cases. For the last three financial years, less than 20% of cases taken up by various channels such as DRTs, Lok Adalats and SARFAESI courts have been successfully resolved. What exactly will the new law do that is different? For one, the new Bill seeks to consolidate all existing laws. Secondly, it specifies a timeframe — 180 days after the process is initiated, plus a 90-day extension — for resolving insolvency. * Insolvency and Bankruptcy Board of India, a regulator that will oversee these new entities. Under the new law, what are the various stages through which the ‘resolution’ process must pass from the time a company files for bankruptcy? There are five stages in all. One, when a loan default occurs, and either the borrower or the lender approaches the NCLT or DRT for initiating the resolution process. Two, the creditors appoint an interim Insolvency Professional (IP) to take control of the debtor’s assets and company’s operations, collect financial information of the debtor from information utilities, and constitute the creditors’ committee. Three, the committee has to then take decisions regarding insolvency resolution by a 75% majority. Four, once a resolution is passed, the committee has to decide on the restructuring process that could either be a revised repayment plan for the company, or liquidation of the assets of the company. If no decision is made during the resolution process, the debtor’s assets will be liquidated to repay the debt. Five, the resolution plan will be sent to the tribunal for final approval, and implemented once approved. Neat. Could the messy situation with regard to promoters like Vijay Mallya or Jaypee have been avoided if this new law had been in place? In an ideal world, if this law were in place, once a default occurred, it would be resolved within 180 days (plus the 90-day extension) after a bankruptcy application was registered. But analysts say setting up the necessary institutional infrastructure could take some time. 1 Nepal & India: Relations at a new low?